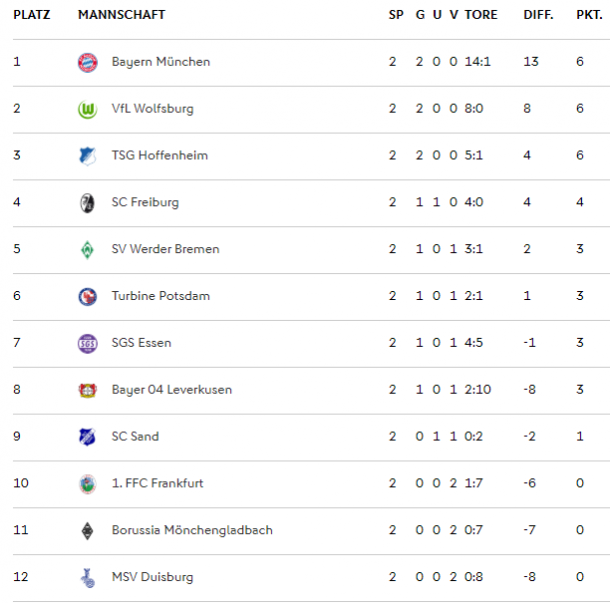 Hoffenheim, Bayern and Wolfsburg continued to fine starts to the year, claiming wins over Frankfurt, Duisburg and Essen as Leverkusen bettered Bremen, Freiburg hit ‘Gladbach for four and Potsdam picked up their first win against Sand. Leonie Pankratz’s 25 minute free kick proved to be too much for the hosts as Bryane Heaberlin let the ball slip from her gasp, unable to do anything about Lena Lattwein’s close-range follow-up. A team not without their troubles in recent times, things fast went from bad to worse for FFC as they conceded a second, just before half time, Tabea Waßmuth’s stretched finish enough for breathing space over the break. Unable to fully clear the ball, TSG were pegged back seven minutes from time when Géraldine Reuteler let fly from outside the box to give Frankfurt a way back into the match. It was, however, for naught as the visitors regained their advantage four minutes later as Anne Fühner bent the ball around Heaberlin. The finally blow inflicted by Nicole Billa in stoppage time, the Austrian wiggling away from the defence with ease, turning and firing beyond the ‘keeper. Scoring for fun in recent times, the Bavarians found themselves uncommonly frustrated by the Zebras at the Grünwalder and seemed to be heading for halt time without anything to show for their first half efforts. However, a clumsy foul by Pia Rybacki had Mirka Derlin pointing to the spot, two minutes from time, Lina Magull clincal from 12-yards. Things were far smoother for the hosts after the break, Jill Roord’s close-range finish five minutes after the restart added to by Magull ten minutes later with a stunning strike from range. A flowing move through the midfielder, spearheaded by Dominika Škorvánková opened up the chance for Mandy Islacker to wrap the game up with a low fourth, three minutes before the whistle. Humbled by Munich last week, Leverkusen rallied well to pick out a win in Bremen, the decisive moment of the match just before the half hour when Barbara Reger wriggled away in the box, slipping the ball into the hungry net. Unable to get going throughout the match, there was little Werder could do as Leverkusen continued to come close, keeping Lena Pauels busy until the whistle. The only real moment of quality from the hosts, 13 minutes from time when a worked free kick clipped the underside of the bar, curling along the frame to ping off of the upright, with the follow-up skied. Having stumbled against TSG last week, Potsdam got their campaign underway with a comfortable win over Sand. Needing little time to find the back of the net, the hosts took the lead 17 minutes in, Sarah Zadrazil on hand to poke Felicitas Rauch’s cut-back in from two yards out. Given a warning when Laura Vetterlein’s free kick curled around the wall and pinged off of the upright, the Svenja Huth drew a strong save from Carina Schlüter before adding a second just after the half hour. 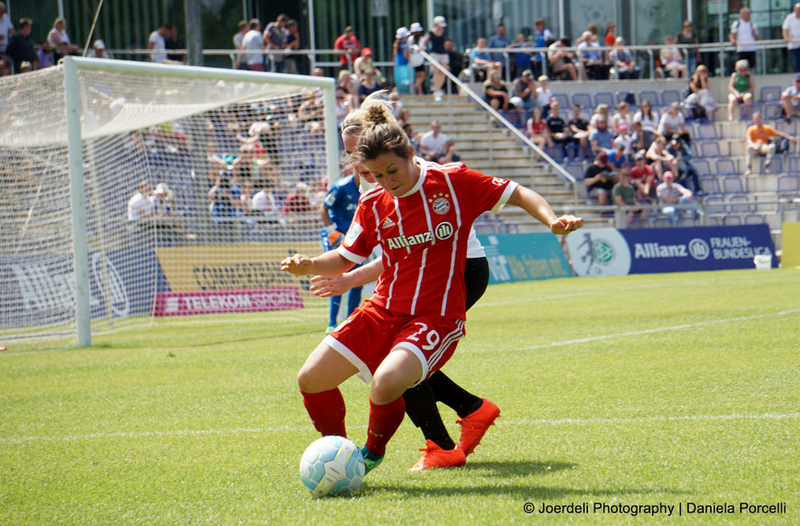 Huth’s free kick bouncing behind the wall of charging attackers and defenders to leave Schlüter and grasping at the air as she dived towards the top left corner. Held by Sand last time out, the Freiburgers made no mistakes against promoted ‘Gladbach. Taking the lead ten minutes in through one of their many talented youngsters, the Sport Club benefited from the advantage as Giulia Gwinn was clipped after delivering the ball to the feet of Klara Bühl, the younger of the two able to pick out the bottom left corner. One became two on the half hour when Lena Lotzen was tripped in the box, captain Rebecca Knaak making no mistakes from 11-metres. Picking up where they left off after the break, 18-year-old Verena Wieder added a third ten minutes into the second half, chasing onto a long ball, taking it beyond and around Michelle Wassenhoven before rolling it into the open net. The match rounded out ten minutes later by the lively Gwinn who was repaid by Bühl for her earlier service. With the ball dinked into the box, Gwinn improvised her shot, throwing her right leg high into the air the volley the ball in. In what many hoped would be a close contest, Wolfsburg showed their class after the break to record a bruising win after Stina Johannes’ goal had seemed impossible to penetrate. Frustrated during the first half, the Wolves needed just three second half minutes to find the breakthrough when Pernille Harder volleyed Lara Dickenmann’s low cross home. With the deadlock broken, the visitors only went up through the gears, making Essen pay for their rare missed chances. Ewa Pajor got her first on three on the hour when she nodded Alex Popp’s cross in at the near post before Nilla Fischer headed a recycled corner in for the third of the day. With the win all but wrapped up, Pajor grabbed her second two minutes after Fischer’s contribution, pulling the ball back across to cut it into the bottom left corner. Too much for SGS to deal with, Pajor made in five two minutes later, firing into the open net after Johannes and her defence had all been pulled to the left side of the box by Popp’s searing run. Popp’s square ball a perfect one for Pajor to attack though it carried a higher danger for Essen as the goalkeeper collided with Popp and was soon stretchered off and will miss the next few months with an injured ankle.